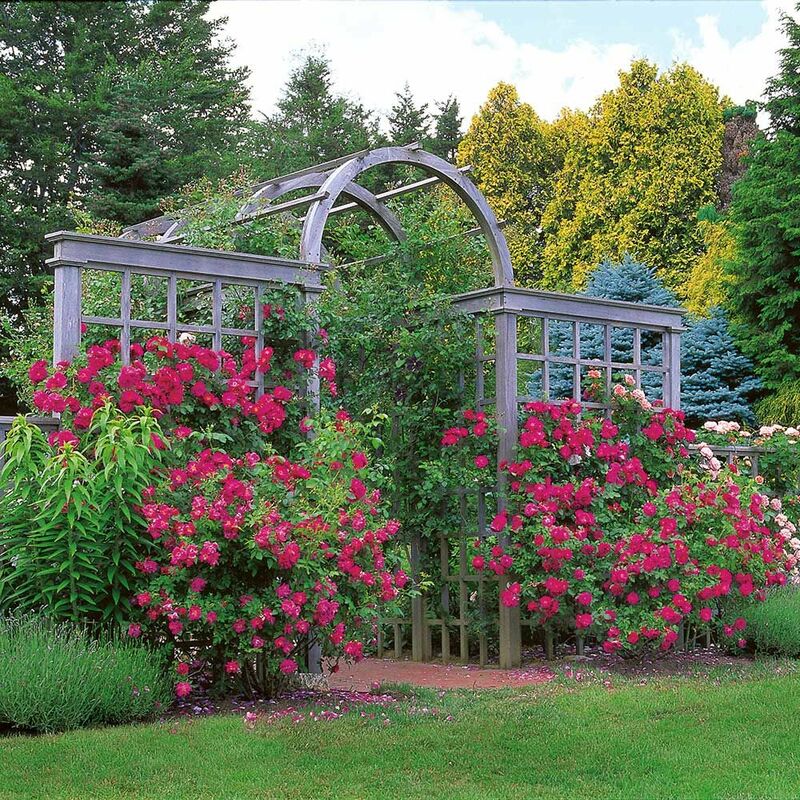 Elevate your garden design by incorporating climbing vines and plants into beds and borders, or by using them to soften fences, walls and wellheads. 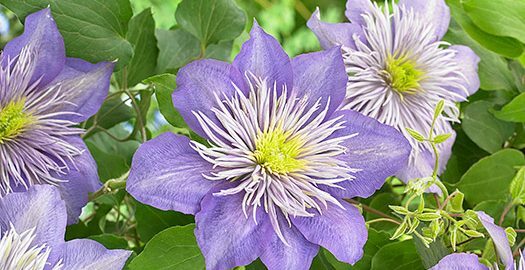 Smaller climbers, including some Clematis varieties, can be used to add vertical interest to container pots or to skirt the trunks of deciduous trees. We offer all of these plants for fall-planting because autumn’s mild weather gives them a chance to settle in under stress-free conditions. They develop root systems before going dormant for winter. When spring comes, they’re poised to begin growing above ground, and they have a nice head start on vines and climbers planted in spring. When you hang the name of a Royal Horticultural Society garden on a new introduction, it had better be good. 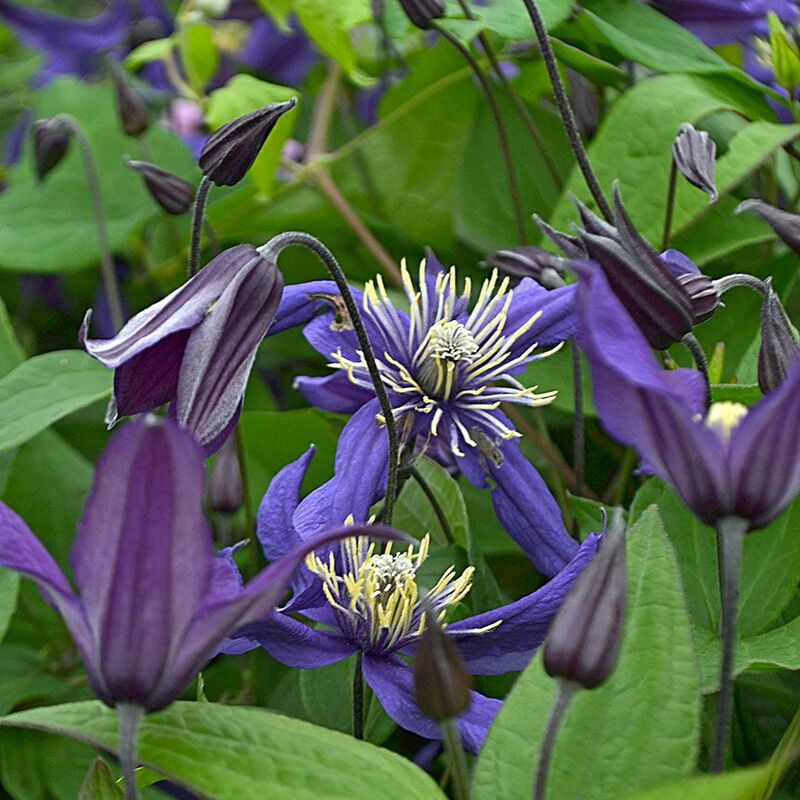 Clematis Rosemoor™ Gardini™ is better than good. It comes from Raymond Evison’s superb breeding program on the Isle of Guernsey. Its showy 5″ purplish-red blooms appear on old and new wood, which means flowering is almost nonstop from early summer to fall. Stunning aerial liaisons can be arranged by pairing two different vines or climbers. 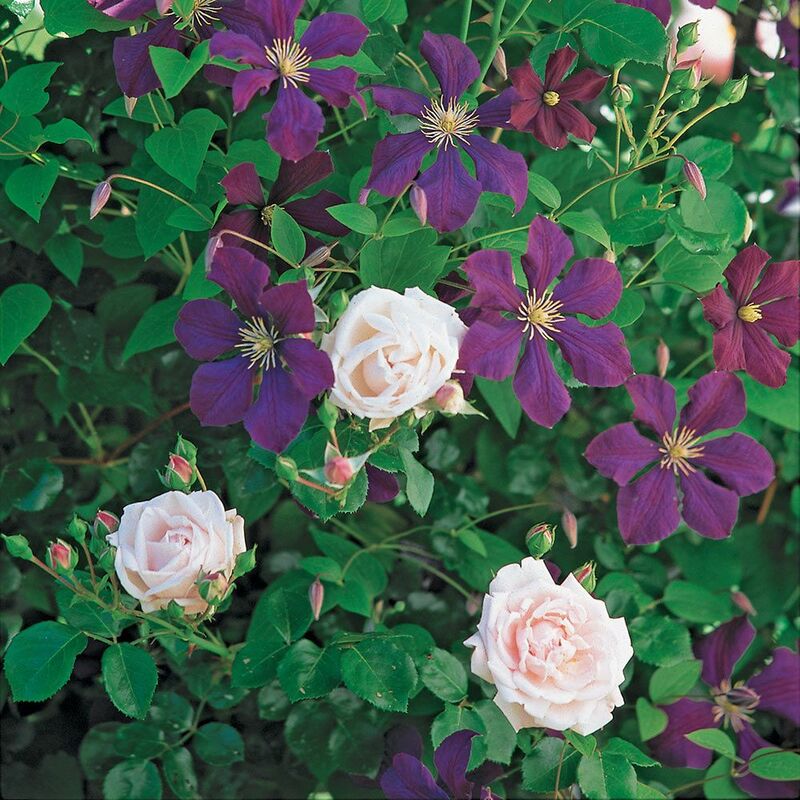 We especially like deep purple Clematis ‘Etoile Violette’ with the blush pink, double-flowered Climbing Rose ‘New Dawn.’ The Clematis clambers up the Rose’s thorny canes and obligingly places its flowers next to those of its host. When the two are at their peak in early July, the display is pure magic, and both generally offer some repeat bloom through summer. ‘New Dawn’ is sweetly fragrant and disease-resistant, especially to black spot, the bane of many Roses. Unusual blossoms made up of 4 slender, twisting petals in vivid purple blue with contrasting yellow anthers appear over a long season on this compact, non-clinging vine. 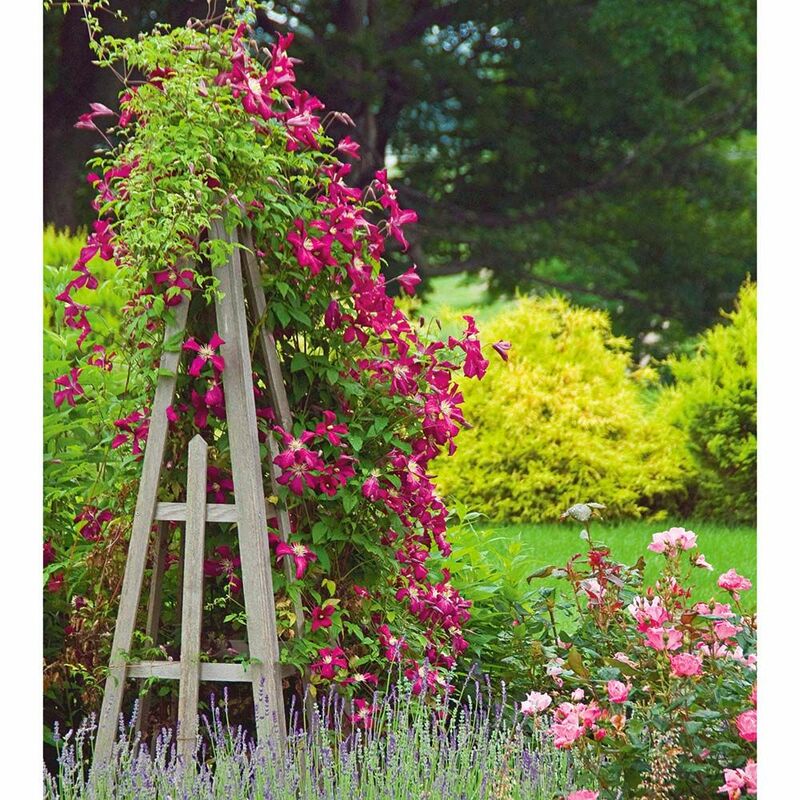 At a mature height of 3-4’, it’s ideal for containers, or for climbing over shrubs. Winner of the RHS Award of Garden Merit. Hydrangea is a valuable genus of some 100 species of shrubs and vines grown for their large and very showy flower heads. 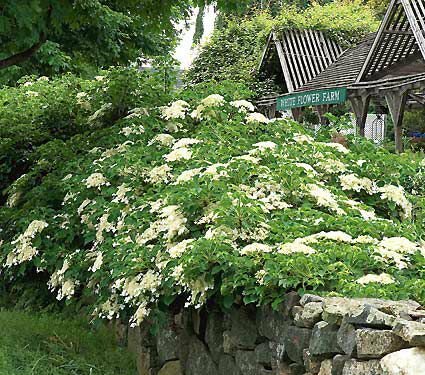 Hydrangea anomala petiolaris, or Climbing Hydrangea as it’s more commonly called, is a vigorous deciduous vine from Japan and Korea whose heart-shaped foliage and large white clusters of June flowers make it an attractive covering for a wall, fence, or large tree. Climbing Rose ‘William Baffin’ has yet to receive the attention it deserves. It bears semidouble, deep pink flowers in abundance in late June, with recurrent bloom well into fall. It is also exceptionally vigorous and hardy, the only recurrent climber available to gardeners in Zones 3 and 4. It’s destined to become one of the most enduring Roses of our era. 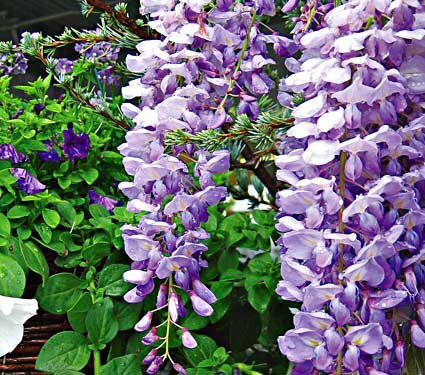 Wisteria is a genus of deciduous vines whose lovely, fragrant flowers and almost overwhelming vigor make them useful in a wide variety of settings. Wisteria Lavender Falls, originally grown in Oklahoma, is an outstanding variety that has blue-violet, 9–20″ cascading racemes that have the scent of grape jelly. The really exciting part is that they reappear several times during the summer.